The 25 Peseta coin has its origins in the middle of the 19th century, when the currency of a united Spain took on the reforms that led to its introduction. The name peseta itself comes from the Catalonian word “peça”, which translates loosely as “fraction”. It is actually from this region that the word peseta for the currency was first used, in the earliest part of the 19th century. Unlike most currencies, the peseta never actually took on a symbol for the currency, although there were many attempts to introduce a broadly used one, such as Pt – Pts – Pta – Ptas and several variations that used superior letters and the like. This became a particular problem for typewriters and was eventually addressed by early versions of Personal Computers. 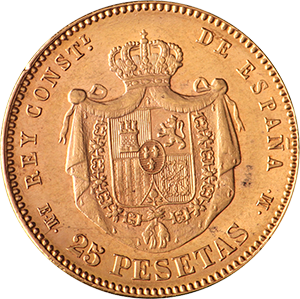 The 25 Peseta coin was of high-quality gold, its purity being 21.6 carats, more than 90% pure. This meant its gold content measured 0.2333 oz, the coin’s gross weight amounting to 8.0645 g. It has a diameter of 24 mm. 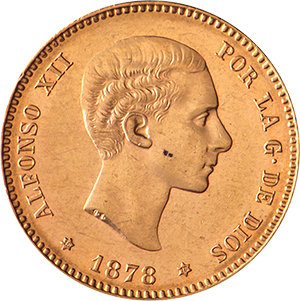 One of the most popular collector’s items are the 25 Peseta coins produced between 1876 and 1881, with King Alfonso II on its obverse surrounded by the words “POR LA G·DE DIOS”. On the coin’s reverse is the Crowned Mantle Coat of Arms, with the words “REY CONSTL. DE ESPAÑA” and denomination surrounding it. While historic, government minted coins are among the safest precious metal products to buy, this does not mean that are not subject to some risk when it comes to forgery. On top of this, due to the age of the coins, some maybe be advertised in very different condition to their reality. It is therefore important to ensure that products are bought from highly respected mints, especially for online vendors. GoldInvestments.co.uk is one of the oldest and most trusted vendors in the UK.